American artist Richard Artschwager’s particular talent combines craftsmanship, intelligence, irony, and playful attitude toward life and art. His style has been variously associated with Pop Art, because of his remodeling of everyday objects (Artschwager also built the Formica-surfaced sculptures of one of Pop’s primary founders, Claes Oldenburg). His work is also connected to Minimalism, because of his elegant, starkly colored, loosely representational “specific objects,” to use Donald Judd’s term. However, Artschwager has always defied categories and reductive descriptions. He may have had a Pop Artist’s wit, but he didn’t combine labels into a hybrid art. As the interview reveals, he sought originality using elements of life that he’d happened to notice. Born in 1923, Artschwager spent most of his childhood in Las Cruces, New Mexico. He studied biology at Cornell University, in Ithaca, New York, during which time he was drafted into the Army in WWII, serving in Europe and ultimately being posted as an intelligence officer to Vienna, where he met his future wife. Upon his return to the US, he finished his degree at Cornell, but now in physics. He and his wife then moved to New York City, where he held various jobs to support his family, which led him to design and manufacture furniture. That led to his receiving a commission to construct inexpensive portable altars for ships and to thinking about utilitarian objects and how they could be transformed into art. During this time he was making paintings on rough-surfaced Celotex fiberboard. The shift to making impractical but familiar objects using Formica’s famously fake surfaces — materials he not only saw as ubiquitous but also considered ugly — changed his own art. He had his first exhibition of such works in 1965, at the Leo Castelli Gallery, then the bastion of Pop Art, having written his own (obviously successful) letter of introduction. Having had his works shown and collected the world over, at the age of 89 Artschwager continues to produce. He recently returned to Las Cruces, where he grew up. His latest works reconstruct images of the Southwestern landscape he felt close to all his life, in combinations of drawing, pastel, and collage. 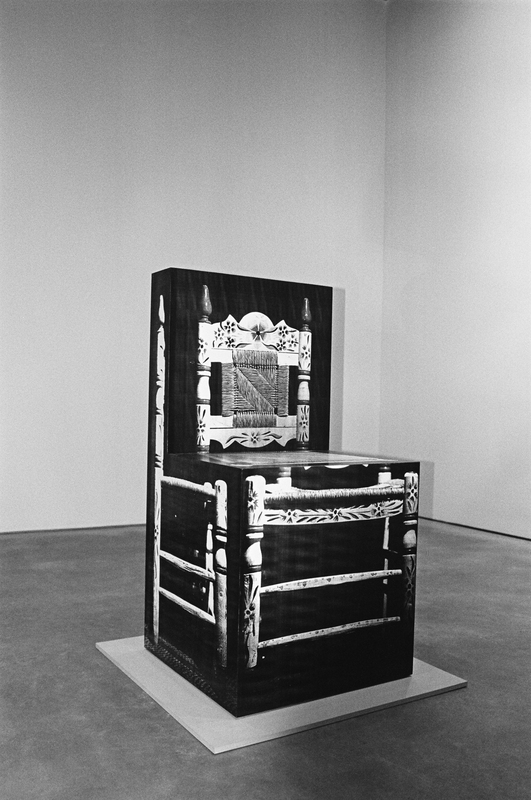 Since 1991 the David Nolan Gallery has represented Richard Artschwager. Nolan, together with Eneas Capalbo, founder of The National Exemplar Gallery, talked to the artist about his new work and how he came to make it. A second major retrospective of his works (the first was in 1988) is currently on view at the Whitney Museum in New York City. ENEAS CAPALBO — Is this the first time you’ve shown your pastel drawings of the desert? 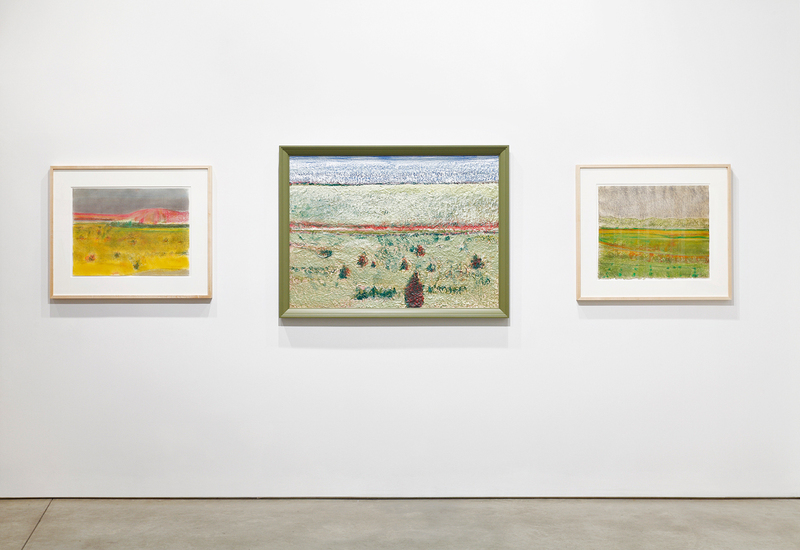 RICHARD ARTSCHWAGER — My previous exhibition included watercolors of landscapes from the late 1950s along with the pastels from 2011. DAVID NOLAN — Are they from memory as well as from photographs? 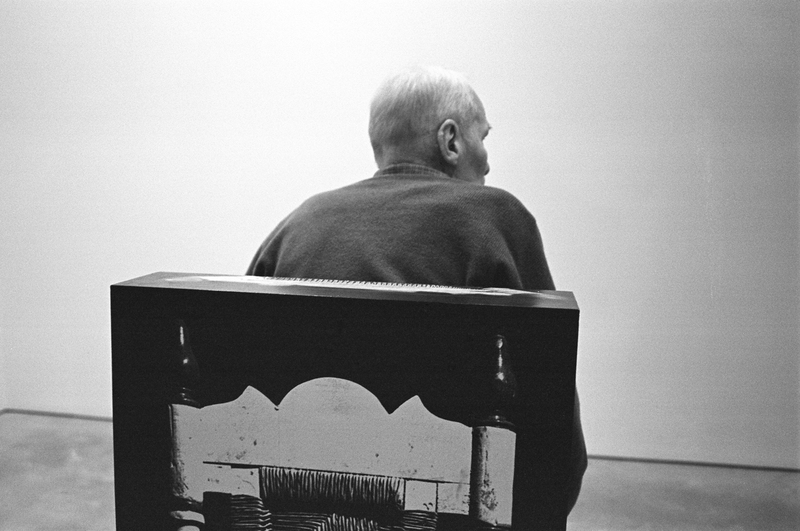 RICHARD ARTSCHWAGER — For some, I just started drawing, sometimes with a particular view in mind. But I change them. For example, I might start out overemphasizing a road and then quiet it down. These are the result. DAVID NOLAN — Is the road’s verticality in some of the drawings used as a balance against the horizon? RICHARD ARTSCHWAGER — Yeah, mostly against the different mountains and horizons I choose to draw. ENEAS CAPALBO — The black drawing, the one of you driving — are those headlights? RICHARD ARTSCHWAGER — Yeah, it’s at night. I forget these things sometimes. ENEAS CAPALBO — Do you like driving in the desert? RICHARD ARTSCHWAGER — Always — anytime, day or night. Each has its moods. DAVID NOLAN — As a kid you traveled a lot. Then you first moved from Washington, D.C., to Las Cruces, New Mexico. Did you drive across country? RICHARD ARTSCHWAGER — My father was living there already, hospitalized with tuberculosis. A friend of the family had offered to drive us there in exchange for a bus ticket back. That’s all he asked for. My mother couldn’t drive. She was just incapable of driving. Some people are. It was very upsetting for her to leave the home that she and my father had built during the Depression. It was a nice home. But then he died, right in front of my mother. She cried for a week, and mourned his loss. ENEAS CAPALBO — Did your mother want to stay in the Southwest because it was where your father had died? RICHARD ARTSCHWAGER — She mourned for a bit and then — like bam! All of a sudden she got caught up in the place, in the landscape. She started painting landscapes. She said, “This is great! I am not leaving here.” So I grew up there. One could do worse. DAVID NOLAN — You left to come back east to go to college? RICHARD ARTSCHWAGER — I went to school at Cornell University, in Ithaca, New York, but was drafted into the Army during my studies and was shipped off to Germany. I went back to Cornell after the war. But I always thought of the Southwest as home and still do. DAVID NOLAN — The curious thing is, you spent quite some time in Munich. RICHARD ARTSCHWAGER — That’s right. ENEAS CAPALBO — I don’t know if I got this right, but I remember reading an interview about your early paintings of buildings. You said you’d gotten the images from some Latino newspapers when you were having people make furniture in your workshop. The photos of buildings were from the papers the workers used to read. RICHARD ARTSCHWAGER — Yes, that’s true. ENEAS CAPALBO — It seems that your art is about very simple things. The drawings are of the place where you grew up. The furniture sculptures are objects anyone has — a chair, a table, mirrors, doors, and so on. The Celotex paintings are of people doing what people do, eating, being together, etc. Critics say your art is conceptual, but to me it’s very simple, almost classical, about life. Is the medium or the material of secondary importance? RICHARD ARTSCHWAGER — Of course! I think of art as “useless looking.” My advice to myself was always to look around. What do you pick up on? Then I go on from there. ENEAS CAPALBO — But people always talk so much about the materials you use. DAVID NOLAN — They want to put Richard in a box, to position him, so to speak. But he doesn’t fit any of those boxes. ENEAS CAPALBO — Did you use Formica because everyone had something made of Formica? RICHARD ARTSCHWAGER — I was really the first artist to use it as a material. For me, the first thing to be considered is above all not abstract. I learned to look around — at what is at hand. Then I decide what to use and how to use it. 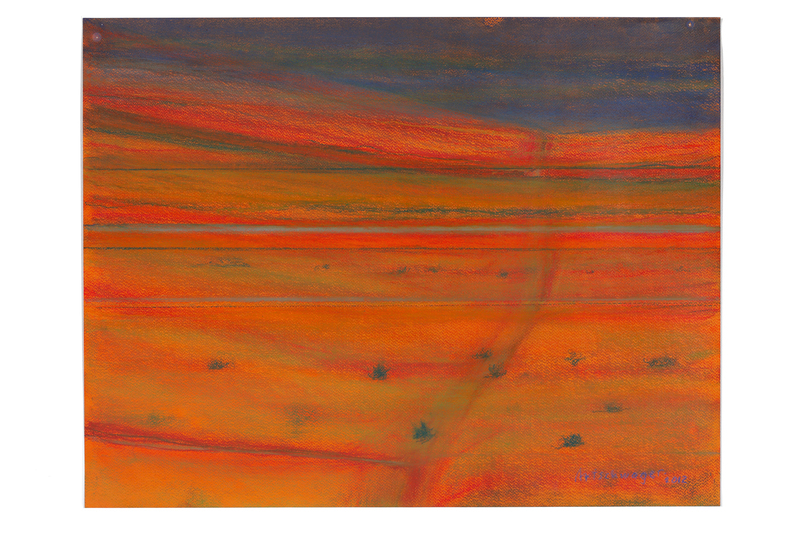 Landscape With Dry Creek Bed, 2012, â¨pastel on orange paper, 19 3/4 x 25 1/2 inches. DAVID NOLAN — One recent change in your work is an increased use of color. You hadn’t used color in such a significant way prior to the recent landscapes. Through the ’70s and ’80s you used a yellow, green, pink Formica, with, say, a brown, black, gray, or white one. I remember, in 1997, you told me you were going to introduce color. You said, “David, that’s what I am going to do next.” I didn’t know what you meant. Then you gave me a small drawing of six objects: a table, a rug, a mirror, and a door, and in the window you drew a colored basket. But it wasn’t clear yet that maybe that drawing was a clue to where you were going with color. That colored basket changed a lot. But the change to color really began in 2006, when you painted a road on brown-flocked paper to make a landscape picture — the one that now hangs in the Winterthur Museum’s collection. RICHARD ARTSCHWAGER — Something small triggers a move. You go on from there. ENEAS CAPALBO — When I saw your last show here and the way you used pastels — in such an unsentimental way — I decided I had to meet David because I had to meet you — because of the way you draw. How do you do it? RICHARD ARTSCHWAGER — You wake up and flash on something, like it’s the first thing you see. DAVID NOLAN — Did the 1997 drawing — the room with the six objects and the basket in the window — lead to all the others? ENEAS CAPALBO — Even the colors are the same: red, orange, yellow! RICHARD ARTSCHWAGER — Yeah, which was a sort of a violation of the drawing itself. You can draw a complete drawing and then violate it. DAVID NOLAN — So, that answers our question. It led to the landscapes. 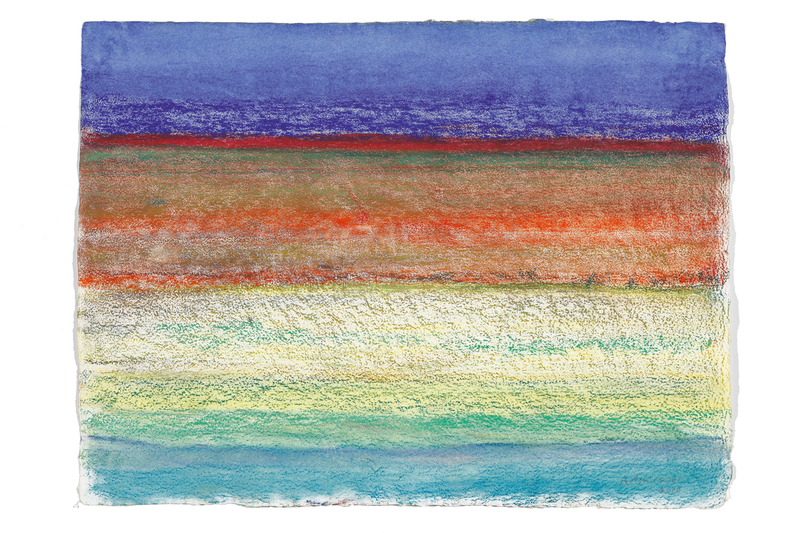 Color was in your mind in ’97, and then, slowly, you allowed yourself to move into landscape drawing, using colored papers, the various colors of the desert landscape. It almost looks expressionist. The compositions are fairly simple. Do you like the desert because it is also an uncluttered landscape — not full of trees or other distractions, a landscape that’s linear, barren, but with mountains? DAVID NOLAN — Was it sub­conscious? DAVID NOLAN — Richard, your responses lead to more questions. Answers or solutions don’t seem to interest you. I like that. ENEAS CAPALBO — Do you wake up and draw the first thing you see? 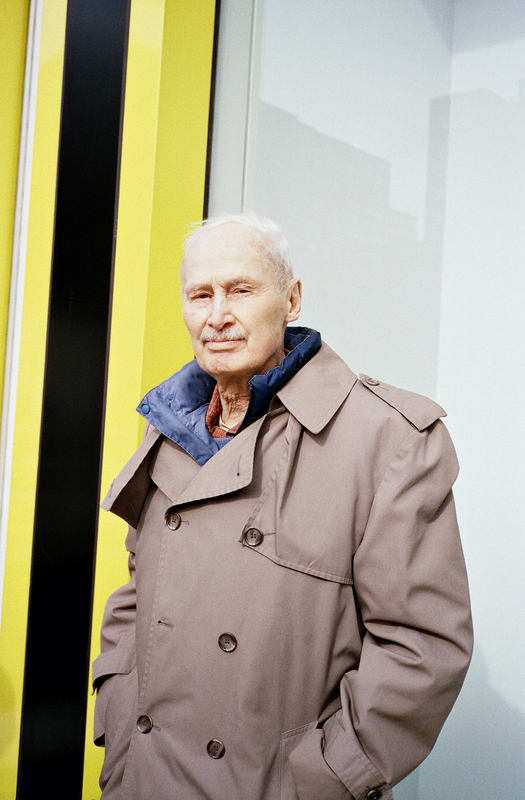 RICHARD ARTSCHWAGER — You draw something, and it’s black and white, and then you infect one spot with color, on purpose. You violate it. Then you have something, a shot at originality, something new to play with. We’re grown-ups, but we play with things. It’s that attitude that you need to hang on to. ENEAS CAPALBO — I remember a landscape painting from 1962 that Adam McEwen bought from Leo Castelli. It’s in dark green, lighter green, and white, with weird green spirals at the bottom. RICHARD ARTSCHWAGER — Well, it wanted to be a landscape. I started drawing and then made this and then added something to give it muscle and balance. That’s something everybody does. But I was doing that at a time when perspective was basically forbidden in art. When you do anything that’s forbidden, you also have a chance to be original. ENEAS CAPALBO — In the ’60s paintings had to be flat. ENEAS CAPALBO — Yes, food. But the ones that people call abstract — the “weaves,” you’ve said are based on basket weaving. Are they abstract? RICHARD ARTSCHWAGER — Maybe. Depends on how you see them. ENEAS CAPALBO — I love the tablecloth. DAVID NOLAN — The bright-colored tablecloth affected the composition in the same way that the window basket did in the drawing of six objects. ENEAS CAPALBO — You designed the facade of the David Nolan Gallery — and you did another facade in Vienna. How did that come about? RICHARD ARTSCHWAGER — It was basically a commission. Georg Kargl, who owns the gallery in Vienna, asked me to design his facade. DAVID NOLAN — The facade at my gallery happened because Richard’s exhibition opened the space here on 29 th Street. Richard was curious about the gallery and asked, “What does the facade look like?” I told him what we were thinking of doing and started to draw it out. Richard said, “It shouldn’t be like that. You shouldn’t have that division there on the glass, it should be like this.” He started to sketch it and I said, “Why not meet with Markus Dochantschi of studioMDA? You have a very specific idea. You should suggest to him how it could look.” So I stood across the road with Markus while Richard sketched out how it should look. He came up with the color scheme, the mirrors, the fenestration and how the whole dialogue of shapes and forms should work together. Richard designed everything, even the thickness of the glass. ENEAS CAPALBO — It’s the best gallery facade I know of. Anyways, I hear you’re moving back to the Southwest? When was the last time you were there? RICHARD ARTSCHWAGER — A year ago, to visit my daughter. I’m going to New Mexico directly after this exhibition opens. And my sister lives in Arizona. Oddly enough, the Southwest hasn’t all been spoiled. There’s enough of it left. I want a large open landscape.